I read this article and found it very interesting, thought it might be something for you. 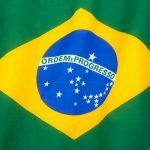 The article is called 15 Things to Know About the Brazilian Flag and is located at http://trip-n-travel.com/listicle/19449/. Every independent country in the world has its own flag as a symbol representing the culture and ideals of the people of that country. Often the colors and design chosen are there for a distinct reason and to express something meaningful to the rest of the world. 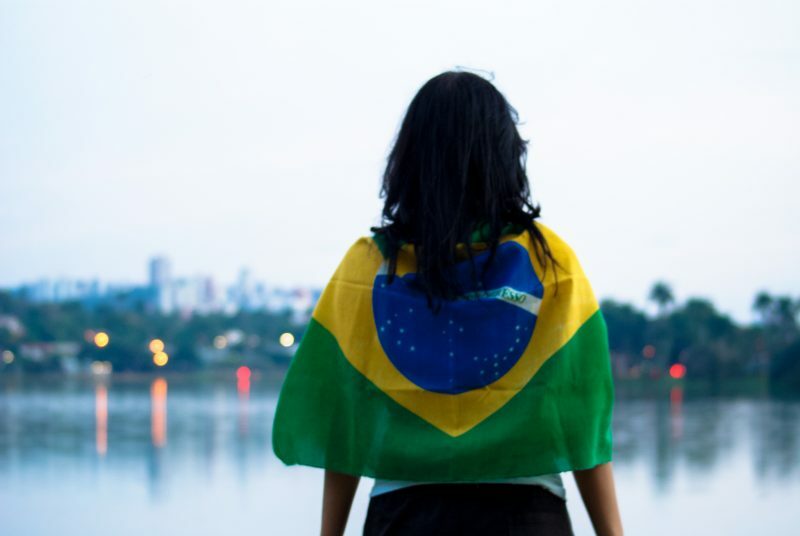 Here are some more details and facts exploring the national flag of Brazil, iconic in the world and perhaps best known at sporting events. The national flag of Brazil has recognized the world over for its vibrant colors and unique design. It’s particularly iconic in terms of sporting events and is often seen on t-shirts, hats and other accessories world wide. The current flag was recognized as the official flag of Brazil on November 19th, 1889 when it replaced the previous flag of the Empire of Brazil. The current flag was adapted from the old design and created by Raimundo Teixeira Mendes and with the help also of Miguel Lemos, Manuel Pereira Reis, and Decio Villares. Raimundo Teixeira Mendes, the chief designer was also a philosopher and mathematician. He has been credited with creating the motto as well as the main design of the flag. He was in favour of the Positivist view point, believing in peace, opposing wars and in the long-term dissolution of nations. The flag has a dark green background in the center of which is a yellow diamond. Within the diamond is a dark blue circle, like a celestial globe, inside of which are 27 five- pointed white stars that seem like the sky at night. The current green background and yellow diamond have been maintained from the original flag of the Empire of Brazil. The green is there to represent the first Emperor of Brazil, Pedro 1 of the House of Braganza, and the yellow represents his wife, Empress Maria Leopolina, of the House of Hasburg. The 27 five-pointed stars are there as symbols of each of the states in the Federal district of Brazil. They are arranged within the blue globe in the center of the flag as a reflection of the stars in the sky over Rio de Janeiro as they actually were on the date of November 19th, 1889. 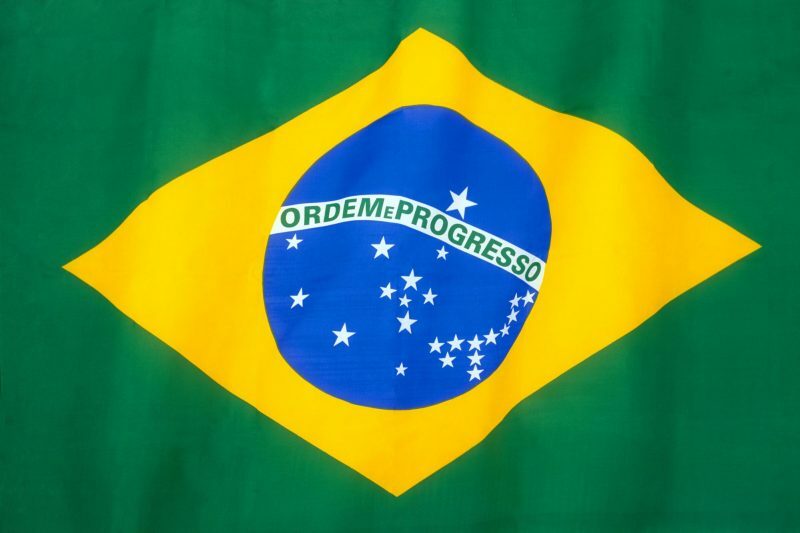 Written in a white banner through the middle of the blue globe is the national motto of Brazil, Ordem e Progresso – which means Order and Progress. The motto was apparently inspired by French philosopher Auguste Comte and his motto of positivism, “Love as a principle and order as the basis; progress as the 5. goal”. Some say that as well as representations of the houses of the Emperor and his wife, the colors are also there as powerful symbols of the natural beauty of Brazil. The dark green represents the lush Amazon rainforest and jungle forests of Brazil and the yellow symbolizes the gold reserves of Brazil and its natural riches and minerals. During the time that Portugal has it’s territories in the Americas (what is Brazil today), there was no official flag other than the use of the Portuguese national flag. What happened over time is that flags that were used on ships sailing to Brazil with goods, adapted from their original concept as a representation of the entire Portuguese Empire and became most commonly used in Brazil. The flag consisted of a golden armillary sphere (the emblem of King Manuel 1 of Portugal). The flag during this time adapted further from the simple armillary sphere to incorporate a blue background. The country had changed status and was now designated to the rank of kingdom, forming part of the United Kingdom of Portugal, Brazil and the Algarves. The golden sphere became the new insignia of Brazil as a kingdom. During these years the flag changed to include parts of the current design, namely the dark green background and the yellow diamond that as mentioned above were included as an homage to the houses of Pedro I and his wife. It also featured the imperial coat of arms. When Brazil became a republic the basis of the current design was conceived. Moving away from the years as a constitutional monarchy, the country wanted to embrace the new social atmosphere and reflect the change in the design of the flag. That said, the idea was also to preserve some of the old in order to ease the transition and highlight the importance of unity as a nation, which is why the design still includes the original green and yellow of the empire flag. There is a national hymn in honor of the flag always sung and performed on flag day (November 19th). The lyrics are by Olavo Bilac and the music composed by Francisco Braga. The chorus translated into English is as follows: Take the affection enclosed, In our Youthful chest, Dear symbol of the land, of the beloved land of Brazil! It is quite incredible that the flag shows the stars as they were supposedly seen on that night of 19th November 1889. In 1992, the flag was renewed to include more stars as new states were created. The stars were also slightly rearranged for accuracy in terms of their actual astrological positioning. As in every country, there is special flag protocol including specific regulations and rules concerning the flag. The flag must always be flown at the Praca de Tres Poderes (Three Powers Plaza) in the capital of Brazil, Brasilia. 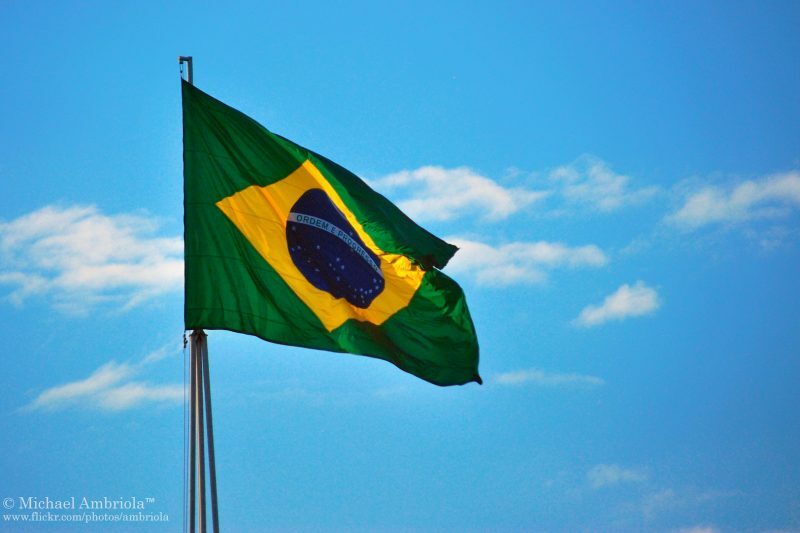 If a foreign flag is raised next to the flag of Brazil, it must be along its right side. The only time this is waived is during a sporting event (prizing ceremony) if a foreign athlete has won the competition above the Brazilian athlete. There is also an exception to this rule where the flag is used in an embassy or consulate. The flag must by law, be raised and lowered every day at all the presidential palaces, national congress and ministries as well as merchant navy units and Federal, State and Local institutions. If a flag is ruined or when a flag can no longer be used or flown, it must be legally burned in a ceremony that takes place only on flag day November 19th, and this is carried out by the military. As in many countries of the world, whenever there is a national state of official mourning declared, the flag must be flown at half- mast. The rules state that when being flown at half- mast, the flag is first raised to the top of the flagpole and subsequently lowered. If a procession is taking place, the flag always has a black ribbon tied to the top of its mast. Even folding the flag as its own rules to follow! First, the upper portion must be folded into the reverse side. Following this, the lower half is folded also into the reverse side so that just the blue globe and motto face up. After that, it is folded along the width, into 3 parts, so the final result shows just part of the blue globe and motto. This year the 2016 Summer Olympics are to be hosted in Rio, Brazil, and are officially known as Rio 2016. Watch out for this famous, iconic flag being printed on clothes and accessories this year in tribute to the games and the country! The games take place in Rio de Janeiro in August (5 – 21) 2016 at the Marcana Stadium, the motto for the event is Um Mundo Novo, which means in English, A New world.